Today, if you walk through the isles of any grocery store, you will be bombarded with messages about the food on the shelves – “organic,” “natural,” “free range.” But what do these words really mean? Recently, 7th Grade English teacher Heidi Smith led a unit centered on Michael Pollan's fascinating book, The Omnivore’s Dilemma. Pollan’s book tries to answer the complicated question of how exactly the food we eat reaches our plates. As they read, students were often surprised by the realities of the industrial food production system, which Pollan describes in often gruesome detail. The book proved to be an enlightening read for all. Heidi devised a unique culminating project in which each student was asked to create his or her own comic book. 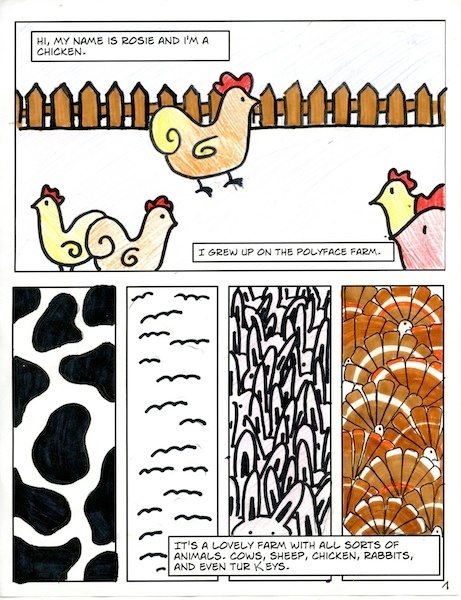 Creating a comic book story allowed students to solidify their understanding of the complicated food production processes covered in Pollan’s book. Students used a fun app called Comic Life to easily create a comic book format into which they could insert their own words and images. Some students illustrated their comics with photos and drawings they found on the internet, while the more artistically inclined created original illustrations. The comics the Seventh Graders produced did a great job explaining complicated concepts in simple, entertaining stories. Heidi realized that the students’ creations would be a perfect addition to both the Cowper and Cohn libraries, where younger students would be able to learn from the Middle Schoolers’ work. Students also produced their own audio recordings of themselves reading their comics to accompany the printed materials. The recordings will also be available at the Cowper and Cohn libraries, and will prove especially useful for English learners. 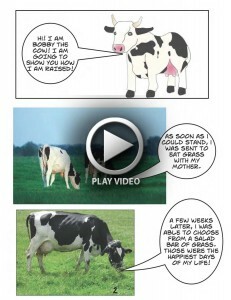 Listen as Pauline B. reads an excerpt from her comic, "The Adventures of Bobby the Cow."